I found a tutorial that I wanted to share, especially since it will be brought to you by SCIENCE! Also by this tutorial from Upstarter Ramblings. But by SCIENCE! Check out how super cool this looks. So, there are some things you’ll need. 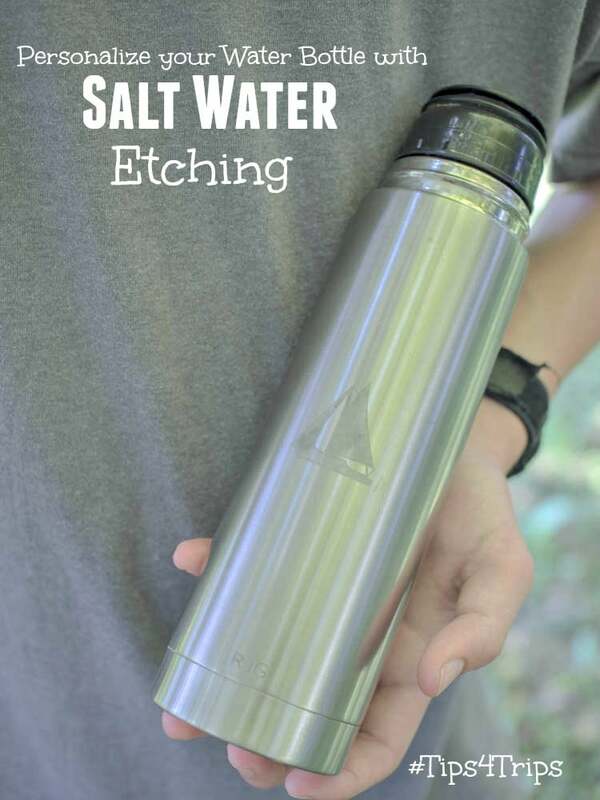 First, you will need whatever it is that is stainless steel that you will be etching – this tutorial uses a water bottle… which are pretty easy to find hanging around at your local home, school camping… many stores have them. 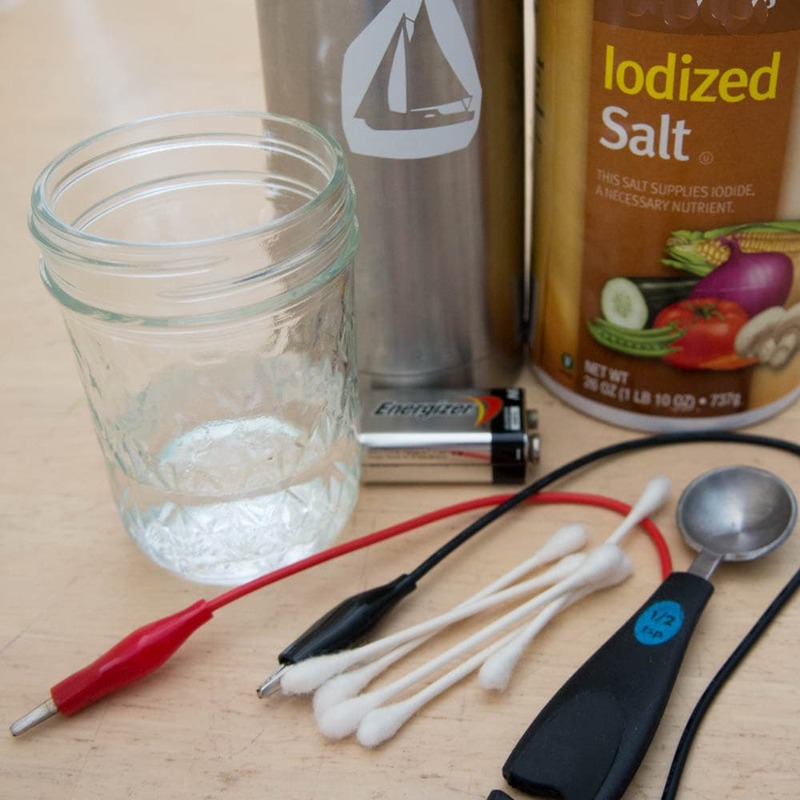 You will also need a lead set with alligator clips, a stencil of the pattern to be etched, 1/2 C of water, 1/2 tsp salt, 9 Volt battery and cotton swabs. 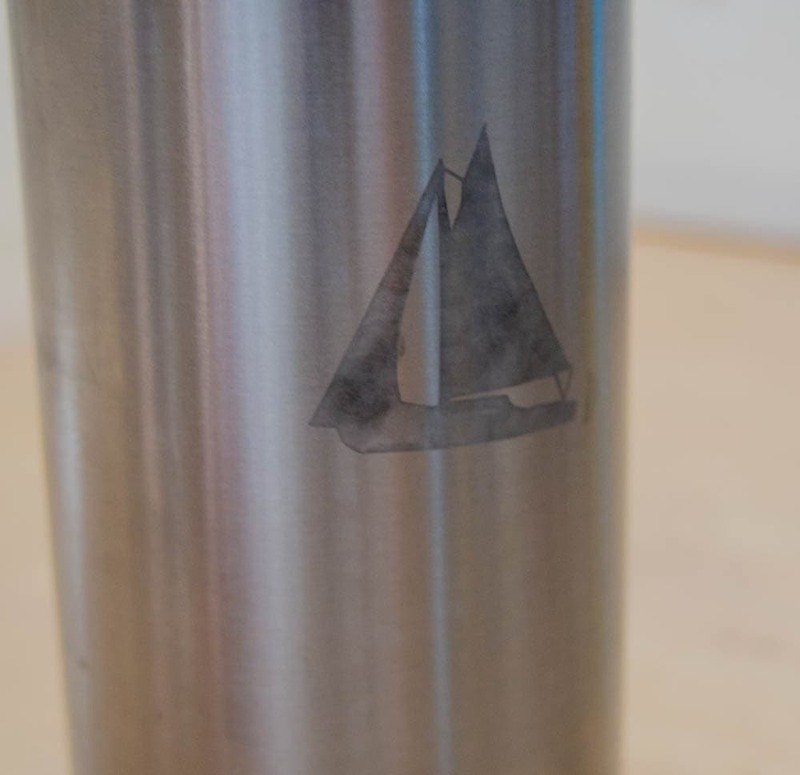 Your first step is to find a design you want to put on your stainless steel thing. 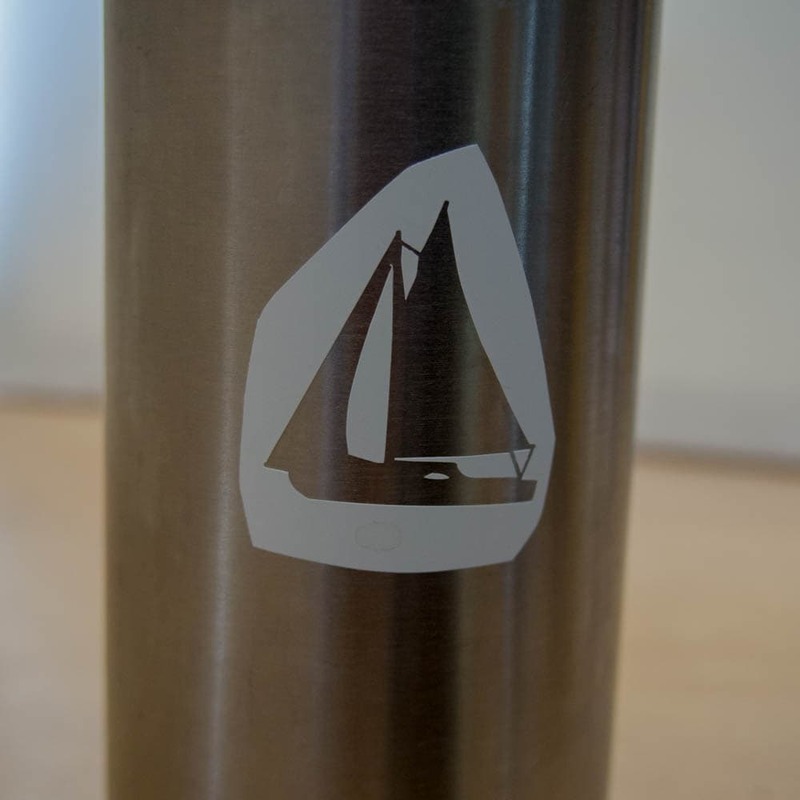 It will need to be a stencil that you can cut out on vinyl, a prepared stencil, or one that you make from masking tape it it is a simple design. As long as the stencil is sticky, you will be good as the parts that aren’t stuck to the surface (the exposed parts) will be what gets etched. Mix the water and salt together into a jar and stir. 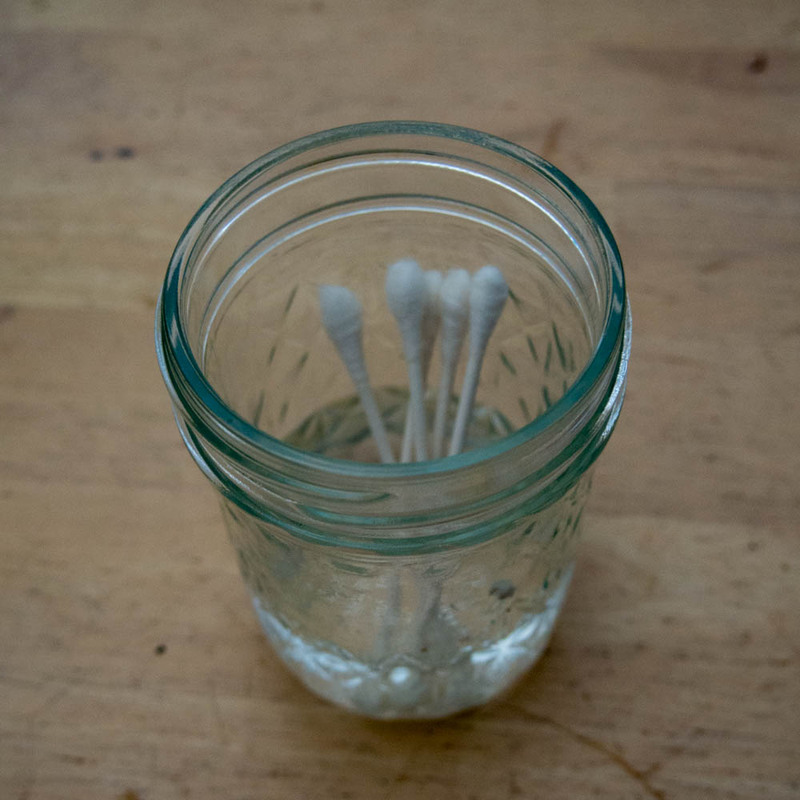 Add a bunch of cotton swabs to the jar. 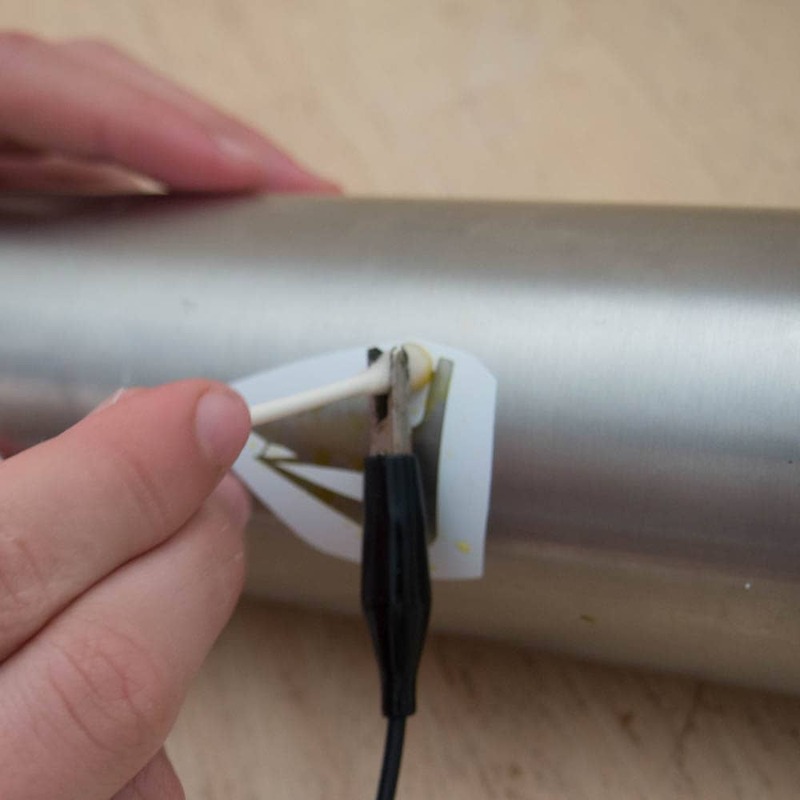 Next, hook one wire from the positive terminal of the batter to the metal water bottle. You can attach it to the open lid with the clip. Hook the other wire from the negative terminal of the battery to the wet end of one of the cotton swabs. 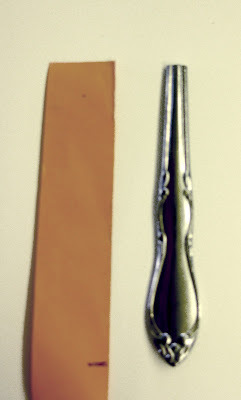 The clip has to be on the wet part of the swab. Place the swab on the bottle where you want your design to show – in the negative spaces of the stencil, and make sure to dab the entire area. 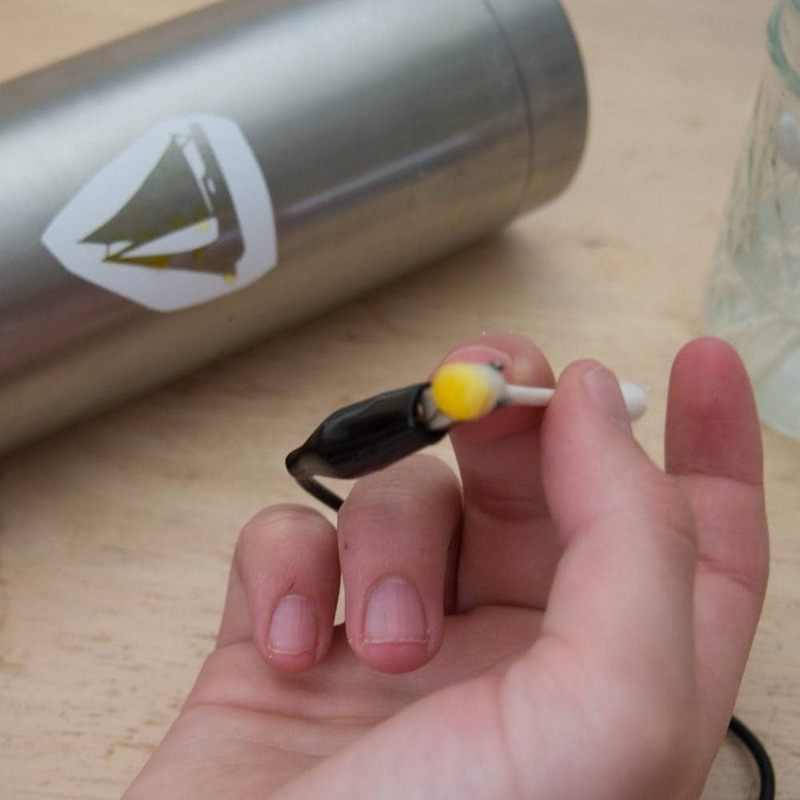 The tip of the swab will get discoloured as metal is transferred from the bottle to the swab so replace it often – hence the handful of cotton swabs needed. Try to cover the area evenly and when you’re done, dry off the design and remove the stencil. Wash away any remaining liquid. And there you have it. A super impressive, super complicated looking project that you can do yourself. It is that time of year where we get ready for the holidays. Today, I have two simple things I use scrapbook paper scraps for. You may not have all the time you want to finish a huge scrapbook page. That’s okay for today because this gives you a few other uses for that scrapbook paper you have lying around or collecting dust in some closet. Or let’s say you are one of those people that wrap presents as you buy them and have scraps or the end of the wrapping paper roll with very little left and you don’t think there’s even enough to wrap one last present. I have some use for that as well. Holiday cards! I am one of those people that ends up celebrating Hanukkah and Christmas. That is why I find things that I can do for both holidays this time of year. For my first craft, it could be used for any holiday and any time of year. 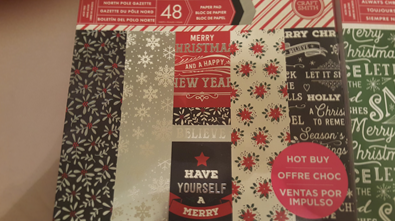 Cards are a fantastic way to use any scraps of paper, stickers, wrapping paper, ribbon, etc. I’m sure you will get an idea with the pictures and let your creativity flow. Now onto what to do, it is really simple- create a card. There are a few samples of what I use and a sample finished product. As you can see, my cats like to get involved. My parrot will too enjoy trying to snag paper out of my hand or off the table. I just use it as an excuse to list them in the handwritten holiday greeting. I also have quite a few friends that also celebrate Hanukkah so I do cards for them as well using blues and silver tones. 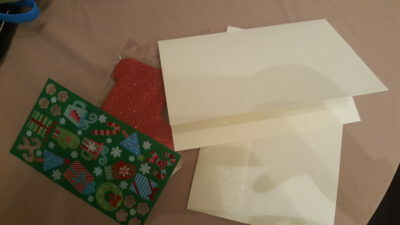 For the second craft I have for this week, the holiday colored paper will work well for most of it. You may just want to snag a few scraps of different shades of orange. I did this project for the holidays for the gym I used to work at. I had the fortunate position to play or watch kids while the parents worked out. We had a huge space to decorate that worked well with idea. If you don’t have a real fireplace or want to do something for a decorating contest, this is always an intriguing way to get people to look a few times. I make a fireplace out of scrapbook paper. I made most of what was necessary while home on bed rest for a week due to medical reasons. When I suggested that we do the same in my office this year so we can do decorating contests and decorating stockings, the whole office got excited about the concept. Take measurements for the space you’d like to use. I then make sure I have enough of the paper to use as a background/mortar. I use that background color to tape or glue the pieces of “brick”. It makes it easier to prep ahead of time and then when it comes to “installing” the fireplace. Then cut out bricks. This works well if you get those random scrap paper packs that have odd sizes too. One time, I got one that had a lot of red and brown pieces in random sizes that made it difficult to use them. In this case, I found yet another awesome way to use them. I create different colors to make it pop out some and look somewhat realistic too. You can make them any size or pattern you’d like or how supplies permit. I began with creating the actual fireplace section. Then I cut out and tape to the black fireplace section the logs and fire. I recommend this first just to make sure you are centered a lot easier before you install the bricks. Then you can start taping or gluing the bricks to the background/mortar. If you want you can even create a mantle above the fireplace. This time, I didn’t do that. Once you have that all done, you can install on the wall, cubicles, or even a door. It will likely take some help with installation if you don’t have a small one. If you aren’t using real stockings, you will want to cut out stockings. I had some glitter ones for making holiday cards so I used one to use for tracing out some for the fireplace to have my co-workers to decorate for a contest. Whatever works for you go for it. When I worked at the gym, I used the glitter ones to give it an added flare for the kids to enjoy. Cotton balls work well for the white fuzzy part of a stocking. Once you have for the stockings, hang them on your fireplace. Designed and made by Moscow artist Kosse Handmade on Etsy from mostly just sculpy and paint. These dragon have such a gentle and unique design to them. The eyes in particular are what drew me in. They’re very large and not typically a style used with dragon designs since they reflect mammal/insect eyes more then the standard reptilian that’s seen. Look at those leaves for wings too! Really inspired and adorable. It’s coming on that time of year that so many of us love; and yet, it creates a large amount of stress. Many of us make a variety of gifts and goodies for our friends and loved ones, we prepare for hosting family, we decorate (that in and of itself can wipe a person out). So many things topple onto our plates in the month of December that it can be easy to forget to just stop and breathe. Tea has always been touted as a soul-soothing remedy but did you know that you don’t just have to drink it? You can bathe in it too! 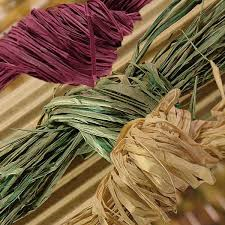 Items you will need along with your herbs are muslin drawstring bags or double layered cheesecloth (but if you want to repurpose those old stockings or save a little money, you can use nylons or support hose as well). All you need is something that water can move through but these three things work best. You can mix and match, use whichever herb combinations you would like. Chamomile, rose petals, and lavender are all soothing ingredients while things like lemon, peppermint, and sage can be revitalizing & rejuvenating. When mixing your herbs in the bag, you’ll want to keep the portions as even as possible. Each bag should have up to 6 tablespoons of herbs so if you’re going for a rose petals and lavender blend, you want three tablespoons of each herb. Essentially, this is just like making yourself a cup of hot tea, just on a bigger scale. You can use more than 6 tablespoons for a stronger tea but it isn’t necessary. Sometimes less is more. You can add things like oatmeal or milk powder but these things are not necessary. The herbs themselves are going to do the heavy lifting; additions to the bag can be used to contribute to softer skin and the like. To use your bath teas, I know the knee-jerk reaction may be to run the water and toss the bag in to steep. This is not the best way to steep your tea bag in a bath. Instead, you will want to hang the bag from the faucet and simply run your bath. It doesn’t need to be boiling to “brew” the tea; you can run it at the normal bath temperatures and it will be just fine. 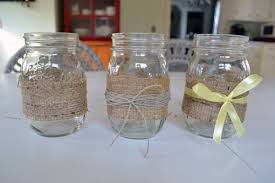 As per usual with my posts, these fun little DIY items not only benefit you, they also make wonderful gifts. So on top of getting some you time in this stressful holiday season, add a little something to your loved ones’ stockings as well. Spread the stress relief! I know I promised a bit more on the host/hostess gift front but found myself under the weather last week so it shall happen today. This is all rather timely since one of the best cures I know for a nasty sore throat is the first item on the gift list: homemade syrups, specifically ginger syrup. 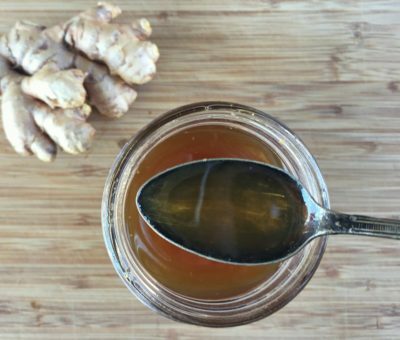 Ginger is a fantastic natural throat and stomach soother. When turned into a syrup, it can be added to soda water for ginger ale or tea for those singers/cold sufferers or even into your morning bowl of oatmeal. This lovely tutorial from The Herbal Academy has a great recipe as well as more info on the health benefits of using ginger syrup. Bottling it up and giving as a gift with instructions seems like a great start to a homemade holiday season. Now what if you’d like to branch out from just ginger? Well then this syrup recipe tutorial from How Sweet Eats is just the thing. Let’s be honest here, that last one is too pretty NOT to make. 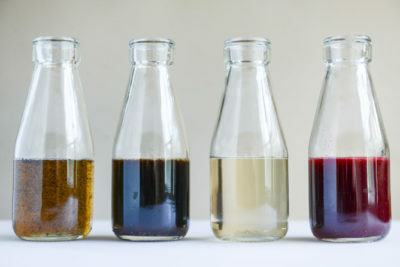 Between vanilla bean, blackberry, brown sugar cinnamon, and almond flavoring syrups I’d be well set with my morning drink additions because coffee isn’t the only thing you could add it to. 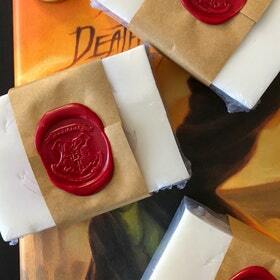 Again, add some pretty packaging and you have a set of syrups tailored to your host’s tastes. What about something geared toward the baker or even a way to make that last tutorial even more from scratch by making your own vanilla extract? I’ve always wanted to do this and Akshayapaatram has not just a recipe for vanilla but citrus ones as well. 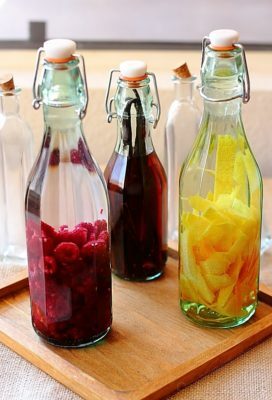 There also seems to be ideas for making your own version of lemon or raspberry liqueur as well. Using some of that vanilla extract to make the vanilla syrup? Brilliant. Add a little carrier, some instructions for refreshing the liquor base every once in a while and another great gift ready to go. Finally, how about something to add our syrups to? As I am lactose intolerant, I often have to search out non-dairy cocoa mixes around this time. Lo and behold, they make soy milk powder! Who knew? Therefore, this year we can turn that into a delicious gift by making hot chocolate mixes in different variations from this tutorial by My Darling Vegan. Definitely find out if your giftee has any kind of soy sensitivity, too, of course. If your host/hostess has no known allergies, feel free to use regular powdered milk instead. 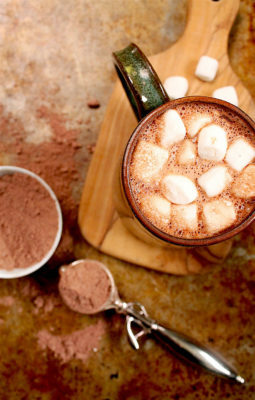 You could definitely package up some of the cocoa with some of the flavored syrups for a grand tasty gift basket. Next week, lets take a look at some cooked and baked gift ideas. I want to share with you some of the handmade small companies I have come across and the sales they are having. Please take a look and always support small business!! First off, I am having a sale on patterns, quilt kits, and custom made pillows! No coupon code is necessary, just head to my Etsy shop where you will automatically save 10% off until Monday. Next, my good friend Rumble & Roar Wandmakers is offering two specials at their Etsy store. HOGWARTSHOLIDAY gets you 20% off through Sunday and OWLPOST gets you free shipping Monday. Kitsune Cuddles is offering 20-30% OFF EVERYTHING IN STORE from today until Monday. Death Duck is offering Sale is 10%-20% off all in stock merch! Including pins, charms, wallets, cloaks, costumes. And Dorkish Art is offering 15% off any purchase of $20 or more with the code: HOLIDAYS15. 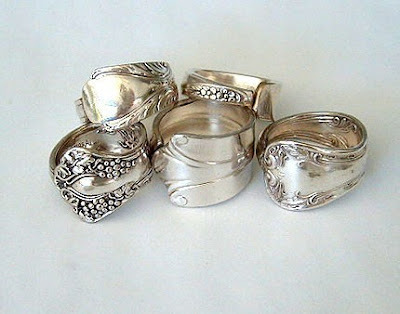 I have to say, I have always loved flatware rings. Whether it’s spoons or forks. There’s one catch though: they need to be silver. Which means you can check out your local antique stores or you can order them on Ebay. I’m using this tutorial from Kristen Danielle Designs as my reference. You can make whatever you like, you just need to make the wrap ring (the top image) a little longer. When you’ve picked out which ring you want to make, pick out your cutlery and make sure it’s sterling silver – it will be stamped on the back of the spoon (900 or 925). Next, measure your finger. You can do this by cutting a strip of paper and cutting it to measure or marking the overlap. If you’re doing a wrap ring, add an extra 1/4 inch for the overlap. If it’s the other type, you can just wrap it on itself. For the next step you’ll need your saw or cutter. If you’re making a wrap ring, you’re going to want to cut the handle at the length you measured. 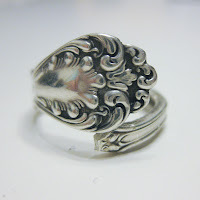 The other ring, you can cut it just below the bowl of the spoon. 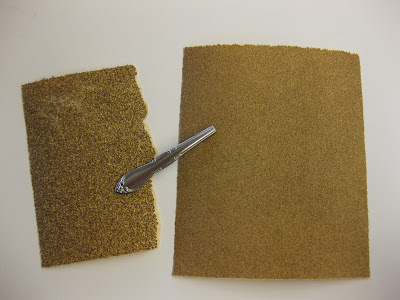 File/sand the cut tend with a metal file or coarse grit sandpaper, and work your way down to fine grit sandpaper to get it super smooth so you don’t cut yourself or others. Your next step is to bed the spoon. 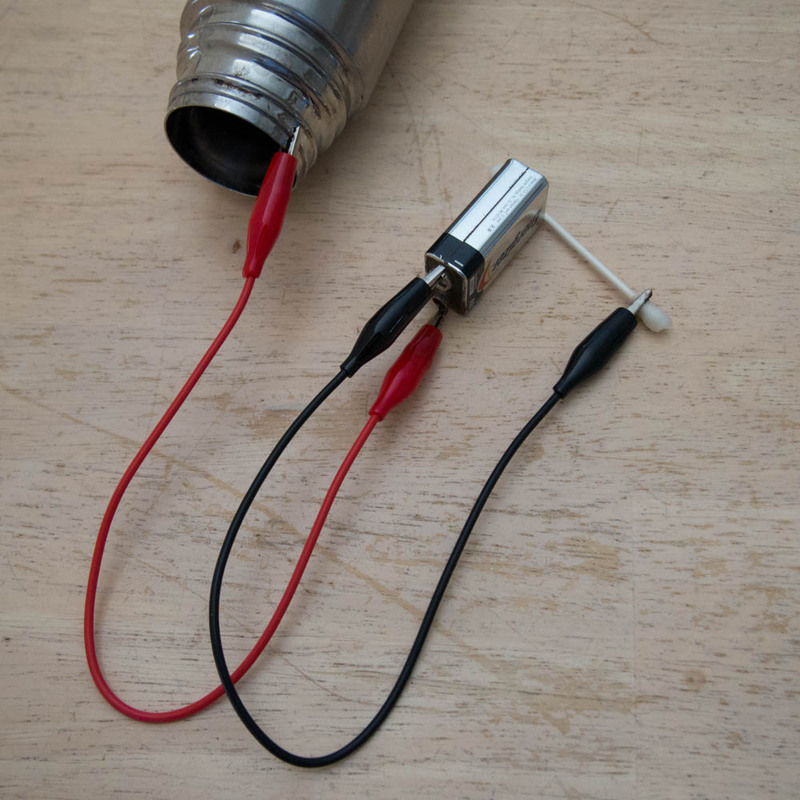 You can bend it around a dowel using the force of your muscles, you can hammer it around the dowel, or you can heat it with a butane torch before you bend. I would test which method works best for you. If you are going to use a hammer, to avoid scratches, wrap the head of the hammer in a folded dishtowel. If you torch it, you’ll need to heat it for a little while, but don’t let it start glowing orange, that’s bad. The last step is to buff or polish the ring to get it to shine. 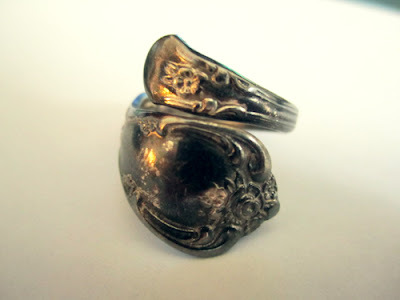 And voila, you have rings that you can give as gifts, or sell if you’re so inclined. Have fun! First, I wanted to take a moment to introduce myself and what I love. My name is Heather. I live in Maryland and love anything related to crafts and baking. A few years back, I wanted to do cards for Hanukkah and Christmas for family and friends. I could have taken the easy way out since I was on bed rest for medical reasons. However, I did it the long or harder way as it gave me something to do. I made them on my own. That was where my renewed enthusiasm began for arts and crafts began. Over the last few years, I began to bake for my gifts and celebrations as well as doing more and more crafts. It was so bad that I began to make decorations for the kids area of the gym I used to work at to give into the need to do more with the kids. A lot of my arts and crafts I want to introduce everyone to, at least in the beginning, will have to do with recycling things you already have. What would you do if you had leftover crayon pieces? What would you do with a jar? By using your imagination and some materials that may seem useless now, can turn out to be fun little things for a special place in the home or just for the holiday dinner. There are endless possibilities. I will do one each week, but they are meant just to help you get the juices flowing and look around to see how to throw away less and reuse more. With Thanksgiving right around the corner, I thought something to celebrate fall and the holiday would be a bit of fun. I know some people are already working there way up for the winter season but I find it is nice to slow down and enjoy this season as much as possible. Then again, I love pumpkin and the changing of the leaves. In keeping with the idea of recycling materials, I got my thinking cap on and thought of two ways we can recycle materials and make a centerpiece for the Thanksgiving meal. Keep in mind that you can play with materials and if you see something around the house that works, use it! This is an easy project and brings that original Thanksgiving to mind in a subtle way. You can do as many as you feel will work for your table. In my family we have a few regular sized tables we use for dinner just because of space. When I was younger, we would fill a basement with long folding tables and create a space for over 20 people to sit at once. If you have multiple tables or a large long table, you may want to consider making a couple of groupings of vases to fill the space. Grab your ribbon and vase/jar. Wrap it with your ribbon or raffia. You can do simple bows or layer multiple materials. Do what you’d like. Stretch your creativity but don’t stress about it. I’m sure you already are worried about food, space, and everything else on the holiday. This isn’t a stressful thing. I find it relaxes me. When all of the wrapping of ribbon is done, be sure to secure it with either hot glue, clear sticky dots, or a simple bow. Once you finished wrapping how you’d like, you will fill the bottom of your vase/jar with your beans and/or corn kernels. I’d recommend about a half inch but not too much either so don’t fill it to the top. Now this is why I recommend the creativity and the cinnamon and nutmeg. You may have already all the food preparation on. However, I like to add a bit of flare with my spices. I shave some of the cinnamon and nutmeg on the kernels to give them some scent. It isn’t overpowering and won’t last more than a few days, but it does give a nice added scent for the weekend. 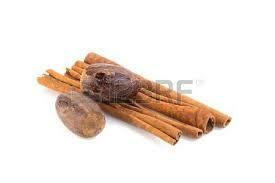 I will also tie some of the cinnamon stick is the raffia or twine I used for the vase. Again, another added natural touch. When it is close to the time everyone sits down, you can turn on the tea lights. You may try real candles with this. I’ve never done it and not sure how stable the heat from the candle will be when you have real candles sitting on top of the beans and corn. Be careful if you try it. Now, go and enjoy the holiday and the festivities! So when it comes to making gifts this time a year, people can get stuck on just what size to make their wonderful homemade items. Be it a blanket, scarf, or even a hat. 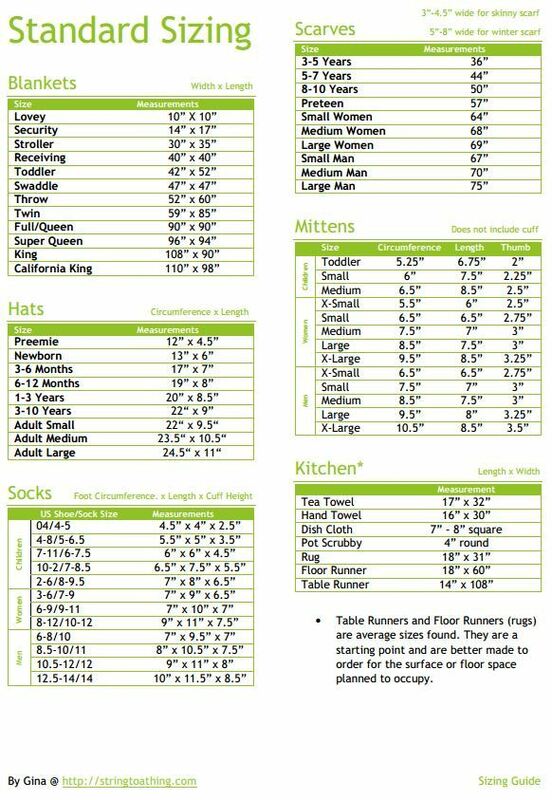 Patterns aren’t always helpful either as they can sometimes just not give an estimated finished size or, if they do give a size you may not have a frame of reference to what those dimensions mean. Well fear not friends, I am here to provide you with some excellent reference charts! It’s Monday, my fellow hackers! Hope you all had a restful and restorative weekend. I know I did! It’s getting round that time of year and gifts are on everyone’s minds; both giving and receiving. Trying to find great gifts for the people you love can be stressful but it doesn’t have to be. If you want to add in a little something extra to those gifts (and give something that can be natural and healthy), here are three easy recipes you can whip up in no time. All these recipes utilize essential oils so please remember when choosing your brand of essential oils, purity and therapeutic value are of high concern. 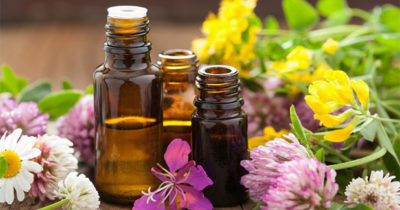 If you’d like to learn more about what to look for when purchasing your essential oils, The Herbal Academy has a wonderful blog post here that covers this. First up is a little recipe I use around my own home a lot lately. It’s colder and thusly, the windows don’t get opened anymore. No fresh air flow tends to make the home a little…stagnant. Instead of spending tons of money a year on fabric deodorizers, you can simply make a fabric and air spray to make your home smell however you’d like. This one is SUPER simple and cheap (the most expensive thing will be the essential oils you choose as some cost more than others). It is also a great little stocking stuffer. Next recipe is essential (ha..hahaha, see what I did there?) for those of us who have cold and dry winters we have to weather through (man, I am on a ROLL today). 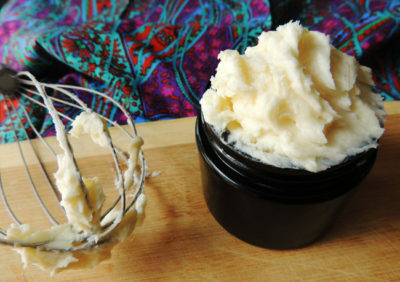 Dry skin can be downright painful but there is a way to combat it and that is with body butters. This recipe is quick and simple to make. Last up is a slightly more difficult one (I promise, not much, though). This is also a great gift idea for winter months as the colder weather can really chap you lips. So what better to gift to people than a tube of lip balm? (You can certainly purchase the ready to use tubes for this one but this can also be put in to small, sealable tins as well). Directions: In a double boiler, combine avocado oil, shea butter, beeswax, coconut oil, vitamin E, and extract. Stir until completely melted. Remove this from heat and stir in your essential oils. Then you can simply pour into your lip balm tubes or tins and let cool. Make sure to cool completely before using! Whatever the season, whatever the reason, each of these recipes is simple and cost-efficient. But most of all, they are natural and beneficial. And they make great gifts for yourself too.